Summit Paradise sits on a flat corner lot just at the base of Snow Summit Resort, the perfect location for skiing in the winter (no parking needed as you can walk from the cabin) or a quick five minute drive to the Big Bear Village. The newly renovated and equipped kitchen offers fresh appliances and cookware for you to whip up your home-cooked meals, and a nice dining table with seating for six. Around the corner, the spacious open living room has comfy seating couches and chairs plus a massive rock wood burning fireplace and mounted flat screen LED HGTV plus a shared hallway bathroom is available on this lower level. Heading upstairs you will find all three sleeping quarters, the first "bunk" room is perfect for the kids, while the open loft leads into the amazing master retreat. This master suite offers a second upper level living room area with wood burning fireplace, private kitchenette with wet bar, foosball and private full bathroom. Both the upper deck and lower level patio offer great ski slope views of Snow Summit Resort as well as outdoor patio seating and a Charcoal BBQ for your use. Equipped with all that you need and recently renovated with your vacation stay in mind, don't pass up your chance to live the splendor life here at Summit Paradise! 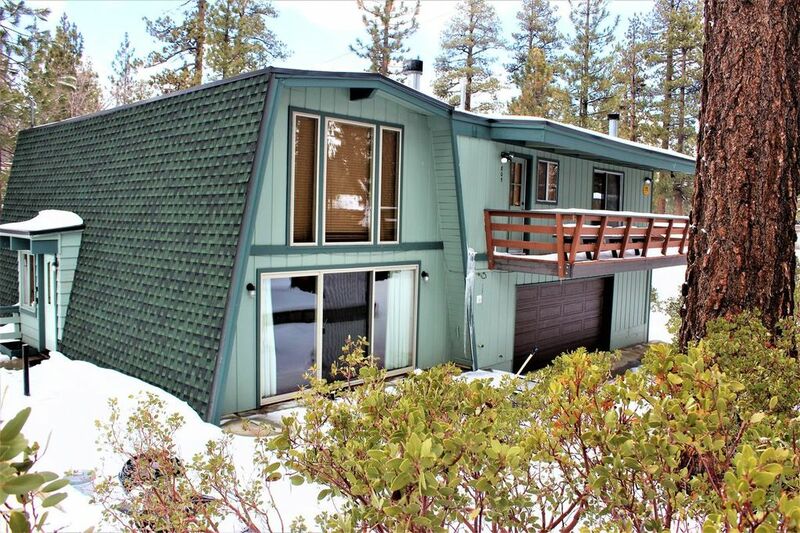 WHAT TO EXPECT FROM A BIG BEAR VACATIONS PROPERTY~ Big Bear Vacations is the premier full-service vacation and cabin rental management agency in beautiful Big Bear Lake. With over 20 years of knowledge and experience, we provide top-notch services and products to our valued owners and guests, from the moment you reserve one of our homes you will be provided with personal and timely communications regarding your stay with us. All of our properties are professionally cleaned and inspected prior to your arrival here at our office and we are dedicated to providing you with the BEST experience possible while you are staying with us! *Please note: The City of Big Bear Lake requires a face-to-face check-in here at our local Big Bear Vacations office. The Credit Card and ID used to make the reservation with us MUST be present at check-in unless otherwise arranged with a Big Bear Vacations representative. Big Bear Vacations has a minimum age requirement of 21 years old and will not release property keys to any person authorized for check-in not meeting this requirement. Great cabin near the slopes! House was spacious, clean and warm. You are important to us! Thank you for being our Guest and taking the time to write such a lovely review. We hope you will be returning soon. Had a wonderful time with my family on Thanksgiving. You are part of the Big Bear vacations family as a returning Guest and we are very excited to continue serving you during your future visits to the mountain. I stayed here with my boyfriend and another couple. The house itself is a bit smaller than the pictures show; however, it was still a nice size for 4 people. We stayed in the large master and it was really nice. The place was warm and we were comfortable the entire time. The house came with essentials and the front desk was very helpful. I will definitely use Big Bear Vacations again! Thank you for choosing Big Bear Vacations for your most recent stay in the mountains! Our team is honored to have been your hosts and are looking forward to the opportunity to host you again many times for your future trips to Big Bear! All of our returning guests do receive a direct loyalty discount so just give us a call when you are ready to return!